I’d decided a long time ago that I wanted to travel to Slovenia…from seeing my parents’ innumerable photographs of beautiful lake Bled, to flicking through adventure travel brochures and being drawn to the challenging but equally visually rewarding treks up into the dramatic Julian Alps, to reading blog posts recounting the charm of the country’s tiny capital, Ljubljana. I had a week’s leave booked at work in September, and although I should sensibly have been saving my money in preparation for my imminent redundancy at the end of October, the draw of Slovenia, of another new adventure to write about on this blog, and of new landscapes, cityscapes, castles, lakes, and mountains to photograph was far too overwhelming to ignore. I knew I’d have to fly into Ljubljana, and it was a city I was very much looking forward to exploring. 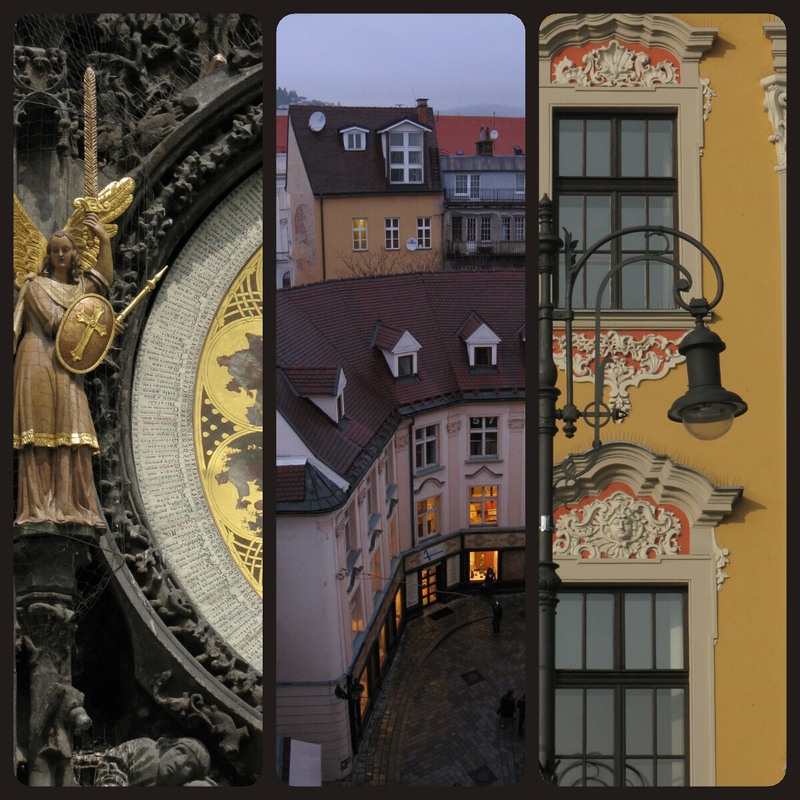 I love eastern European capitals; I love how manageable they are to explore, I love the architecture and quirkiness – Prague is one of my favourite cities, and I also loved Dubrovnik, Bratislava and Krakow, and would happily return to any one of them. So Ljubljana was on the list. And Bled. Bled looked like the kind of place that fairytales were made of. With its emerald-green lake, picture-postcard church on an islet, and medieval castle perched high upon a rocky crag, this was somewhere I just had to see for myself. 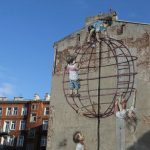 I started to build an itinerary, and as I did I studied maps, searched forums, and perused travel blogs that had been written about the country. 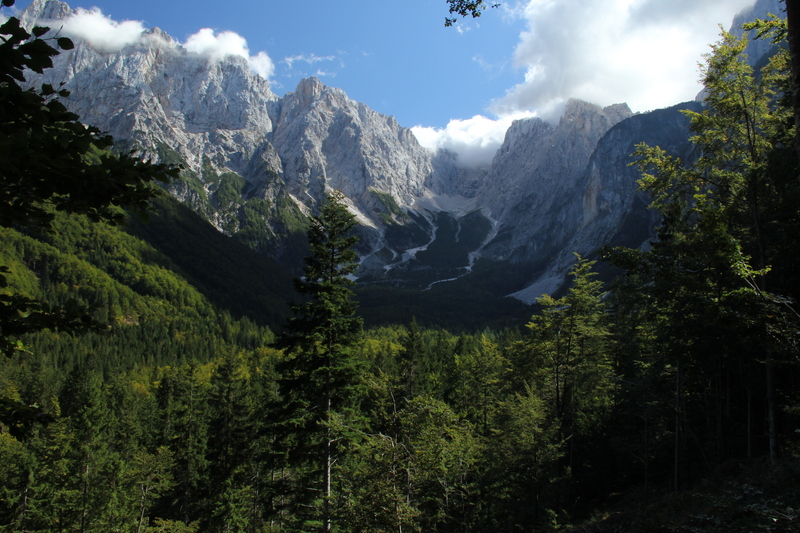 I began to realise just how small Slovenia is, and that sparked the adventurer in me. I wondered how much more of the country we could see in a week. 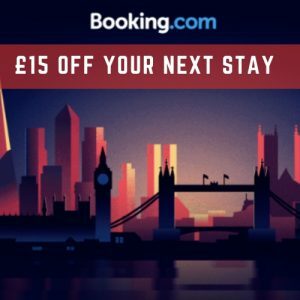 From what I could gather, the public transport links were good (although perhaps not as regular as during the summer months), and travel on local buses and trains was relatively cheap – as were the hostels we could stay at in between. 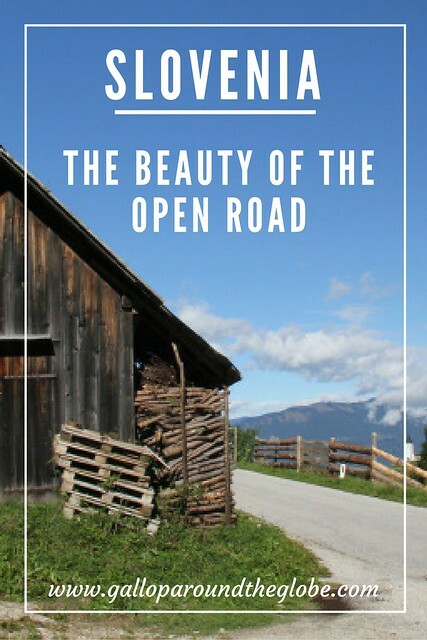 However, many of Slovenia’s roads, particularly those which wind their way up into the mountains – to the most scenic areas of the country – were not roads I really fancied travelling on by bus. But then I got embroiled in a conversation with a couple of friends of mine about the hospitality of the locals during their 2 week tour around Croatia – by car. That was it: we would hire a car and take a roadtrip around Slovenia. Not only that: realising Ljubljana’s proximity to Zagreb, and learning that the Plitvice lakes in Croatia can easily be visited on a day trip from Zagreb, I tagged an extra few days on to my week off, and decided that the road trip would also include a crossing into Croatia – so that I could tick off another place that’s been on my bucket list for some time. 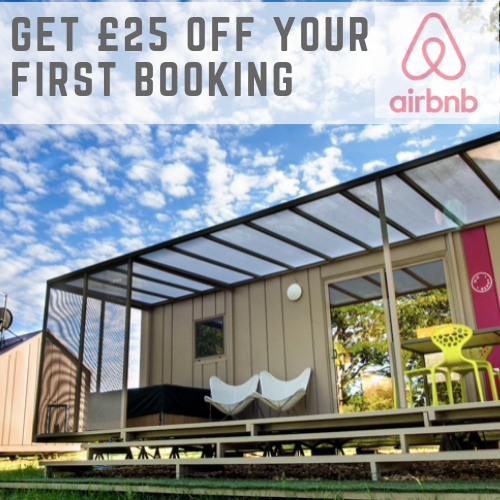 The last time I’d done a road trip was back in 2005, when a few friends and I hired a campervan to travel around the south island of New Zealand, so – 8 years later – I was more than ready for another one. Before picking up the car we gave ourselves a full day to explore Slovenia’s capital. Ljubljana is a pretty small city with a population of only 300,000 so everything is easily navigable on foot. 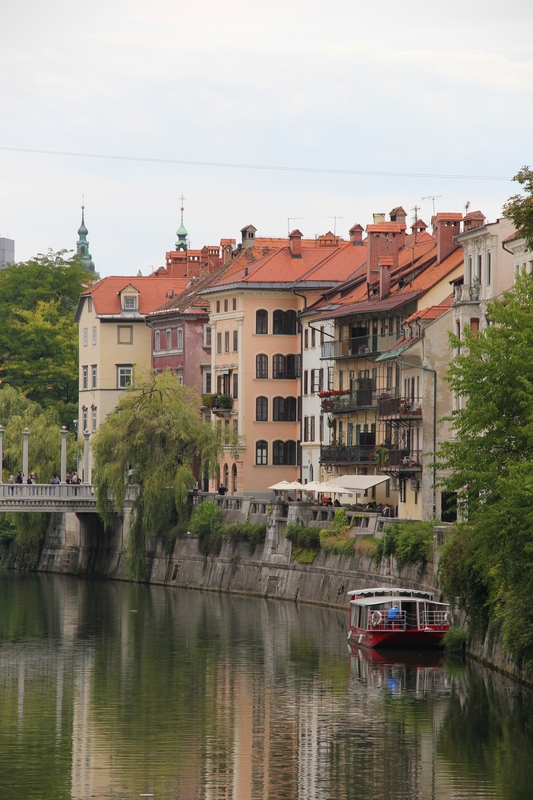 It sits inside the loop of the Ljubljanica river and is therefore dominated by bridges and attractive riverside cafes. I loved wandering around its cobbled streets, admiring its colourful buildings and inquisitively studying its curious and fascinating art. We took a stroll up to the castle, watched a wonderful animated film about its history (narrated by a dragon), marvelled at the hypnotic mystery of a contemporary light installation on display there, witnessed a local gentleman create some wonderful gifts utilising the art of calligraphy, and admired the views of the city down below. To get a view of both the city and its castle, we headed over to Nebotičnik – Ljubljana’s tallest skyscraper. There also seems to be a busy but fairly low-key nightlife here…laid back, friendly establishments where you arrive for one drink and stay for three. We also ate some fantastic food at Pri Škofu, tucked down a little side street in tranquil Krakovo. At the Hertz office in downtown Ljubljana, we were introduced to the vehicle that was to get us around Slovenia and into Croatia safely and surprisingly cheaply for the next 9 days – a little white Volkswagen Up, which appeared almost new and had comparable mileage on its clock. 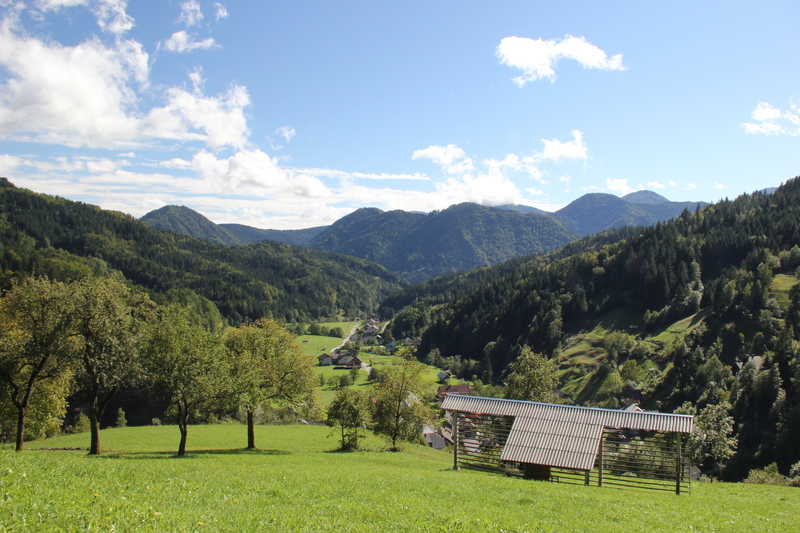 I was impressed by how easily we managed to get ourselves out of Ljubljana and on the road to Kamnik – until we realised that we were actually on the back road to Kamnik, so our planned 30 minute journey took a lot, lot longer. 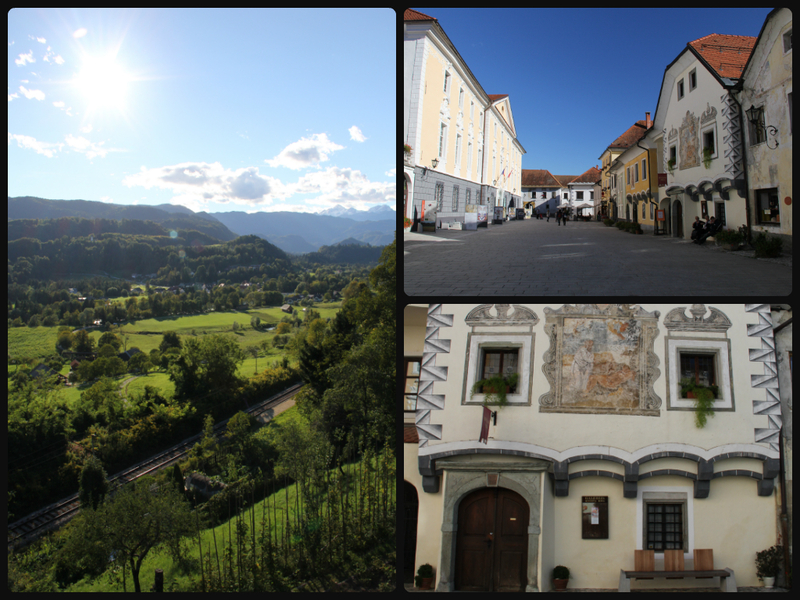 On the plus side though, we drove through some lovely little villages, and had our first views of rural Slovenia. 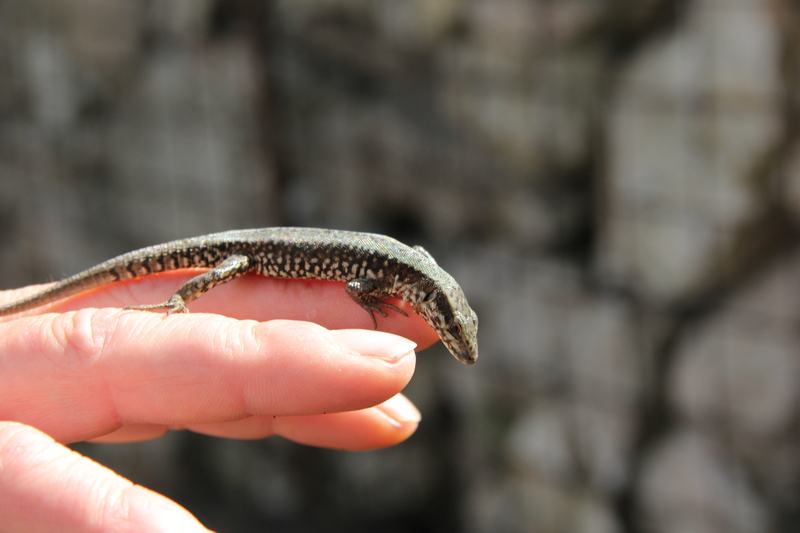 How brave was this little fella? Now we couldn’t come to Kamnik without exploring the alpine pastureland of nearby Velika Planina, made all the more possible by the fact that we had a car in which to do this. In between the trees, there were beautiful views of pristine fields scattered with traditional shepherds huts. As we weren’t pushed for time (Bled is only 57km from Ljubljana), we decided to take the scenic route, following the Sora river through Skofja Loka and Zelezniki, and then on through Kropa and Radovljica, and I’m so glad we did. Whether it was because it was our first truly sunny day here, or because this was our first taste of driving the open road with a new and exciting destination to look forward to at the end of it, or because of the pure adrenalin running through my veins as we drove along heart-stopping narrow roads that clung to the edge of the hillside, I will always remember this journey as having some of the most breathtaking scenery in Slovenia. 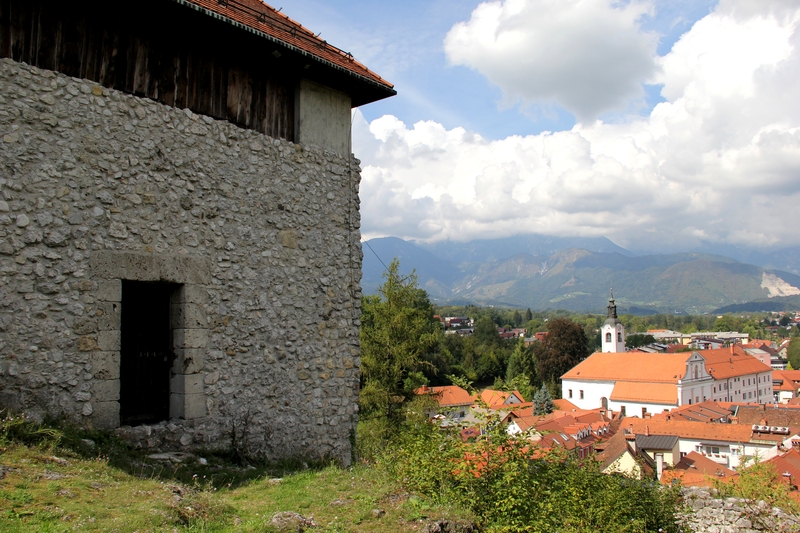 We made a brief stop at Skofja Loka, one of the oldest settlements in Slovenia. Its evocative old town has been protected as a historical monument since 1987. It’s an attractive little place to have a brief wander around, stop for coffee, and a climb up to its castle (which is exactly what we did) but I understand there are also many walking trails covering the surrounding hills. Just before dropping down into the pretty little hillside village of Kropa, we had to park up, get out and stop for 5 minutes – we’d spotted a view which was worthy alone of the heart-stopping moments that came before it. 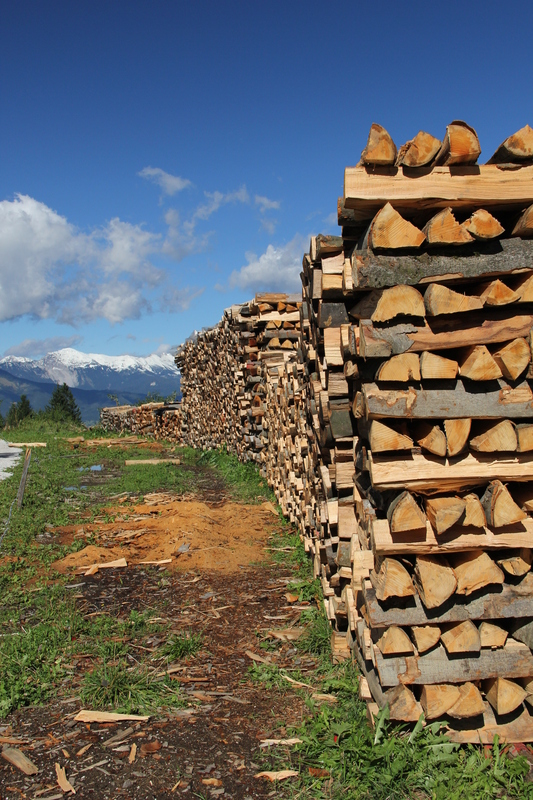 A little wooden hut sat opposite a long stretch of chopped logs, piled up for the winter. As I stood on the corner of the road, at the end of the log pile, in front of me lay the view we’d stopped for : a dramatic ridge in the hillside, at the end of which sat a tiny little white church, contrasting dramatically with the huge expanse of green it was perched upon. 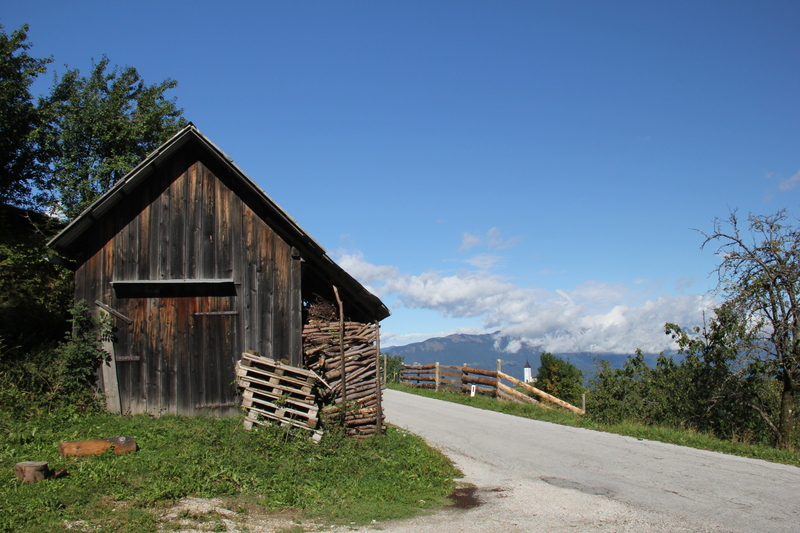 In the background were the snow-capped peaks of the Julian Alps, and above, the smattering of clouds in the clear blue sky created shadows on the land down below them. 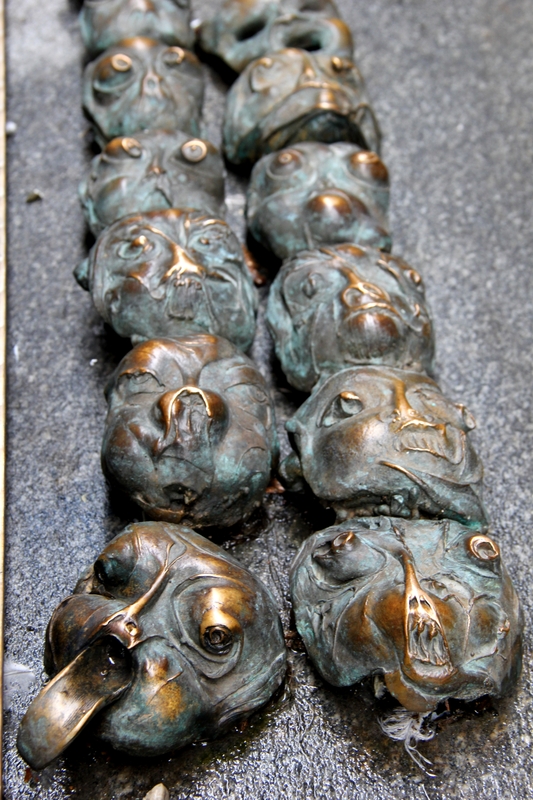 Kropa itself is a former forging village, and the only one in Slovenia where the custom still lives on. Apparently artisans can be seen clanging away in the workshop on the village’s single street ‘Kropa.’ Unfortunately I only found this information out, after having already driven through this charming, remote town, complete with its own beautiful, babbling mountain stream running through it. 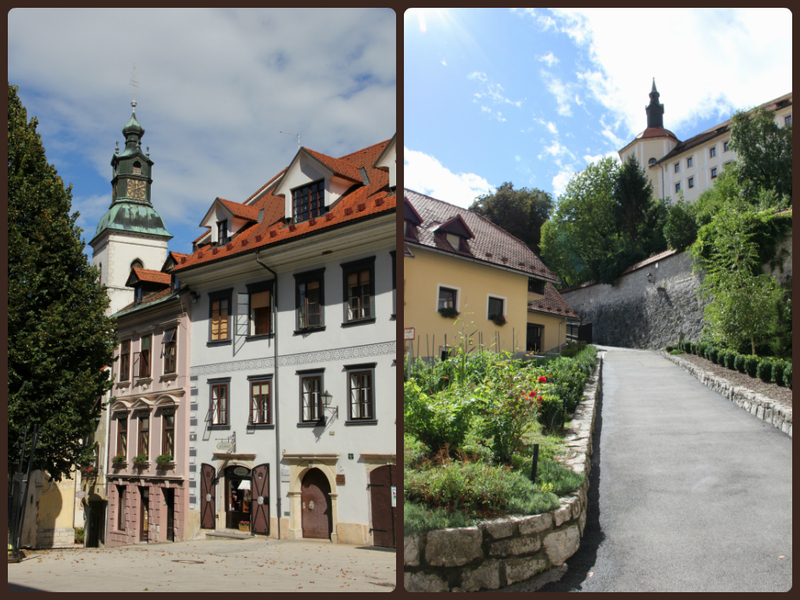 Our final stop was Radovljica, a charming town full of historic buildings. There’s also some incredible views from the old town, of the Alps, including Triglav, and of the roads we’d travelled earlier that afternoon. We drove into Bled along one of it’s busiest and most urbanised roads, full of large hotels and trendy bars, and immediately I was deeply underwhelmed. I expected a small village containing traditional buildings sympathetic to the landscape on which they were located. 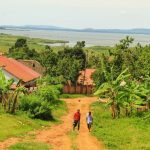 The following morning, as we set out on a 6km walk around the circumference of its lake, I was still feeling a little twinge of disappointment. I wasn’t seeing the beauty of the place that I’d convinced myself I would find. 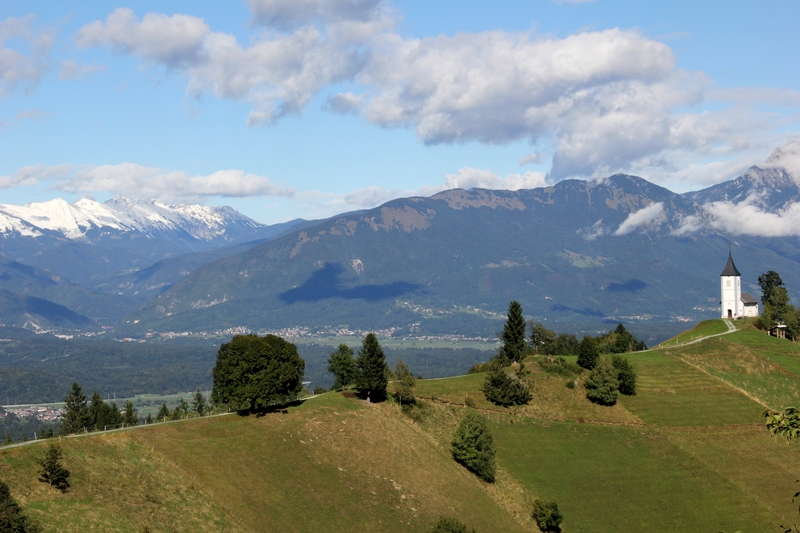 Fortunately, Bled is somewhere that grows on you the more of it you see, and the more time you spend soaking up the vast array of available perspectives of the town and its surroundings – all of which improve tenfold with a little glimmer of sunshine. Not only does the 6km walk around the lake allow you to properly familiarise yourself with the town, but it also gives you a constantly changing perspective of it. Rowing a little wooden boat out to its island gives you another, and then there is the walk up to its castle, and the hikes up through forested hills to 2 of its highest peaks, Osojnica and Ojstrica. It didn’t take long for Bled’s charm and appeal to reveal itself to me…at once tranquil and relaxing, it’s also a place that inspires energy and adventure. 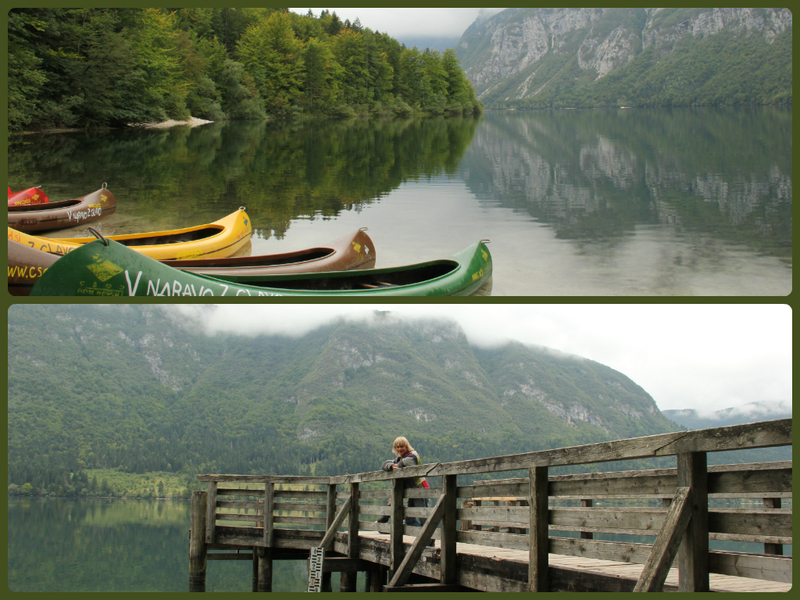 26km south west of Bled is Slovenia’s second lake, lake Bohinj. 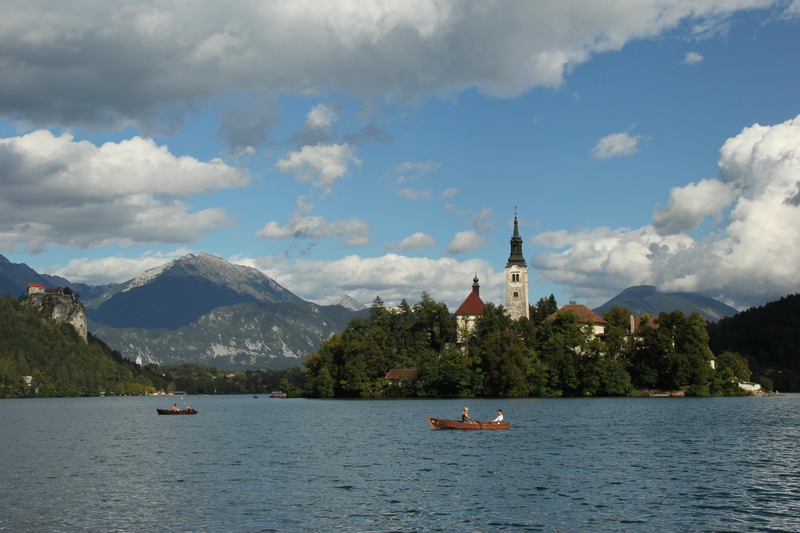 It sees far fewer tourists than Bled because it doesn’t have the same picturesque, fairy-tale appeal. However, with the low-lying cloud, and mountains rising sharply from the lake’s surface, it somehow felt more dramatic, atmospheric, and a had an aura of curious ominousity. 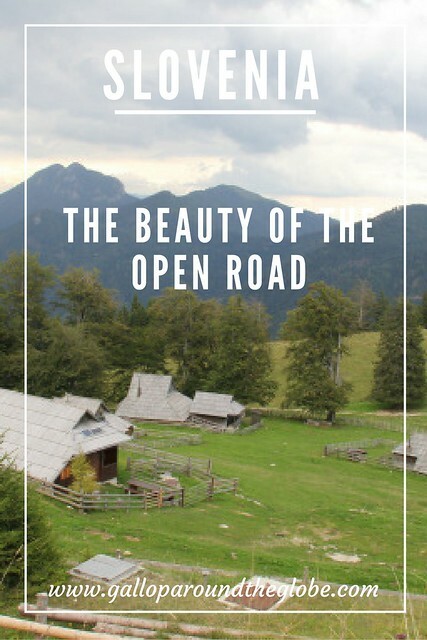 As we drove the beautiful open roads through Kranjska Gora, Slovenia’s largest ski resort, the grass covered mountains – complete with chair lifts standing stationery up to the summit – seemed strangely amiss without the soft white covering of snow upon them. 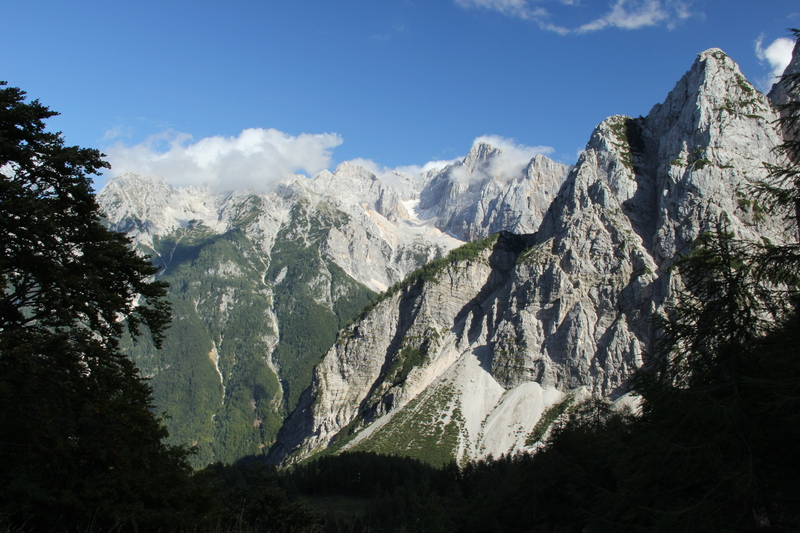 From Kranjska Gora, the road climbed steadily, twisting its way through the dramatic Julian Alps. Our nimble little car coped effortlessly with over 50 of these hairpin turns, and there were plenty of points on the road where we were able to pull over to photograph the spectacular views that passed us with every bend we took. We finally arrived in Kobarid, a charming little town in the Soca river valley complete with its very own WW1 150mm Krupp howitzer! We found a lovely place to stay in the centre, with German-speaking owners (confused me somewhat as Kobarid is much closer to the Italian border!) and a fridge and hob in a cupboard! We didn’t use either of them because we were told it was cheaper to eat out in Kobarid, so we went – on what seemed for a long time to be a wild goose chase – in search of a restaurant that was recommended for its local specialities. We eventually found it, around 2km out of Kobarid, at the end of a narrow unlit road, in the middle of a campsite! The next morning we really started to recognise the beauty of the place we’d decided to lay our heads the previous evening. We drove back out to the location of the restaurant, which in daylight we could appreciate tenfold. The Soča river and its stunning aquamarine waters (which we’d only caught glimpses of the day beforehand) ran right through this town. We parked the car and followed a short pathway down to the rivers edge and found a precariously placed wooden bridge crossing it. Here we were able to get some incredible photos of the rich, magical colour of the waters down below us. We followed the Soča river through the towns of Tolmin and Kanal, the latter of which holds an annual bridge diving competition every August. Inviting as the water looked, plunging 17 metres head first into it was not an activity I fancied entertaining! However I can imagine being a spectator at such an event must be quite a thrill. 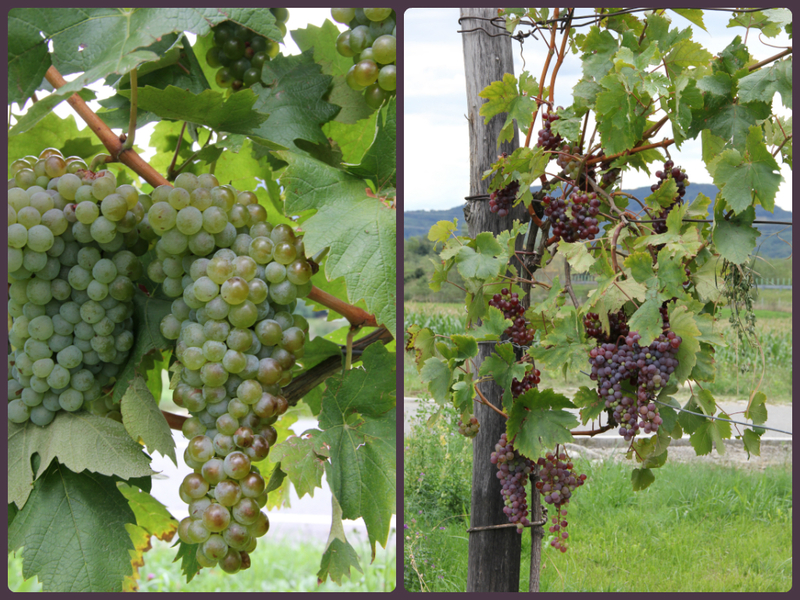 From river valleys, we headed south towards the Vipava valley, Slovenia’s wine-growing region. The roads here are lined with local vineyards, one of which we stopped at to take some photos of the hundreds upon thousands of sun-ripened grapes growing on the vine. Engrossed in photo-taking we didn’t see the owner approaching with his push bike. Armed with little more language than the words for “hello”, “thank you” and “2 dark lasko please”, we were a little concerned how we were going to apologise to this gentleman for trespassing on his land and photographing his crops! Knowing that a smile can go a long way, I turned around and smiled, said hello, and proceeded to compliment him on his grapes – in English! He clearly understood nothing of what I said but chattered away in Slovenian – also with a smile on his face. This was good news I thought; at least he wasn’t about to call the police. Far from it – what he actually did was cut a huge amount of grapes (carefully ensuring he chose a variety of types and colours) off his vine and gave them to us. I was so stunned by his kindness in light of our apparent disrespect for his property that I opened my purse and held out a 5 euro note, which he refused to take. So we left, repeatedly thanking him, and headed off in the direction of Vipava, munching some of the sweetest grapes I’ve ever tasted and throwing the seeds carelessly out the window. In the town of Vipava, we stumbled upon a wine tasting house where we were able to sample some delicious Merlots, possibly made from some of the same grapes we’d consumed only minutes beforehand. Bearing in mind that Slovenia is not commonly known for its wine, I was genuinely and pleasantly surprised by the quality. Consequently we bought 3 bottles, and then contemplated exactly how we were going to fit them into our – already relatively full – backpack. 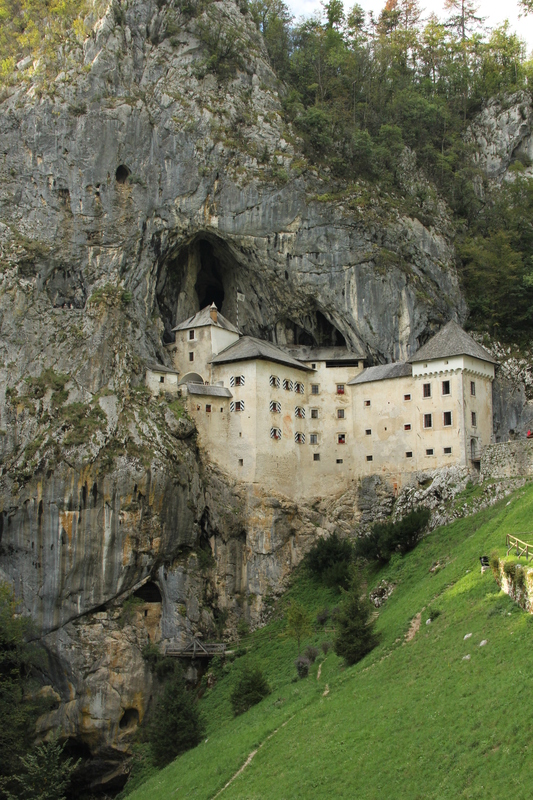 The region of Notranjska is peppered with castles and caves, and Predjama Grad combines both of these: it’s a castle built into the mouth of a cavern halfway up a 123m cliff. It’s the reason I wanted to come to this area of Slovenia, and as you approach it, it’s very clear to see why Predjama Grad has been described as one of the world’s most dramatic castles. Unusual – and possibly unique – in its construction, it looks simply unconquerable. Whilst Predjama Grad was mine, the caves at Postojna and Skocjan were Stu’s reason for wanting to visit this part of Slovenia. However when we arrived here at around 4pm, we realised that our plans to see the castle and both sets of caves today had been wildly optimistic and that we needed to find somewhere close by to rest our heads this evening. We drove into Postojna (the location of one of the sets of caves), hoping to find a lovely little town like all the others we’d passed through, but when we arrived we were very disillusioned. It was characterless and unappealing, so we continued on our way. We decided to head out in the direction of the Skocjan caves, having read about several charming little traditional farmhouses located in the villages surrounding the caves. Driving up through the villages of Matavun, Skocjan, and Betanja, our excitement grew at the prospect of staying somewhere so remote yet so beautiful – in an area surrounded by Karst landscapes, old stone churches and red-tiled roofs. Unfortunately said farmhouses were full so we ended up in a nondescript little town called Divača, drinking at its only pub, with some rather rowdy locals…and an alien. Determined to avoid being caught up in a large group of other tourists, we arrived at the Skocjan caves at around 9am the following morning. Perfect we thought. It was low season, we were the first people there; we may even get our own private tour of this immense network of underground caves. We couldn’t have been more wrong. So, along with around 50 Chinese tourists (who all turned up 5 minutes after we’d arrived), approximately the same number of Slovenian tourists, on top of every nationality in between, we were herded around the caves in a fashion akin to my worst nightmare whilst travelling. Nonetheless, adamant that I was not going to let this one experience tarnish what had been an amazing trip so far, I did my best to see past my immediate surroundings (which were noisy, claustrophobic and restricting) and towards the purpose of my visit – to witness one of the largest underground canyons in the world. 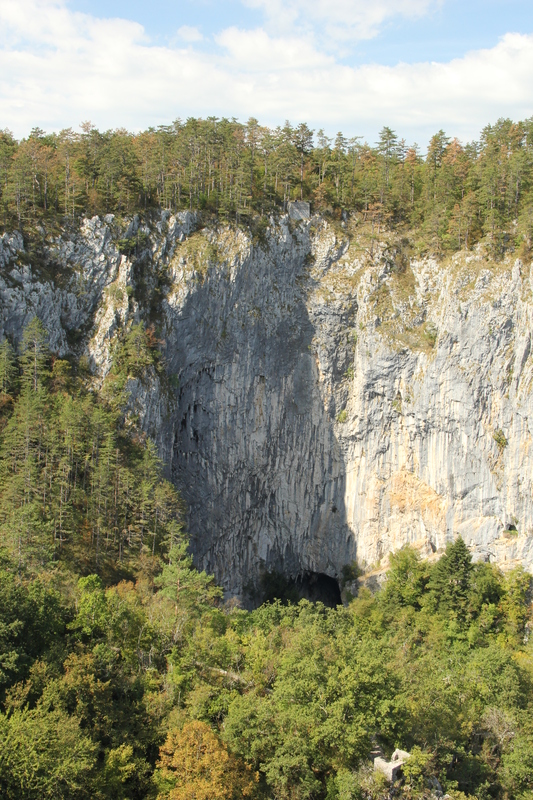 And it was impressive: the Skocjan cave network is over 6km in length and up to 170m below ground. It is a natural phenomena of global significance, ranking alongside the Grand Canyon, Great Barrier Reef, Galapagos Islands, and Mount Everest. Clinging to the barriers along the slippery narrow pathways of the epic Murmuring Cave, you start to understand why. 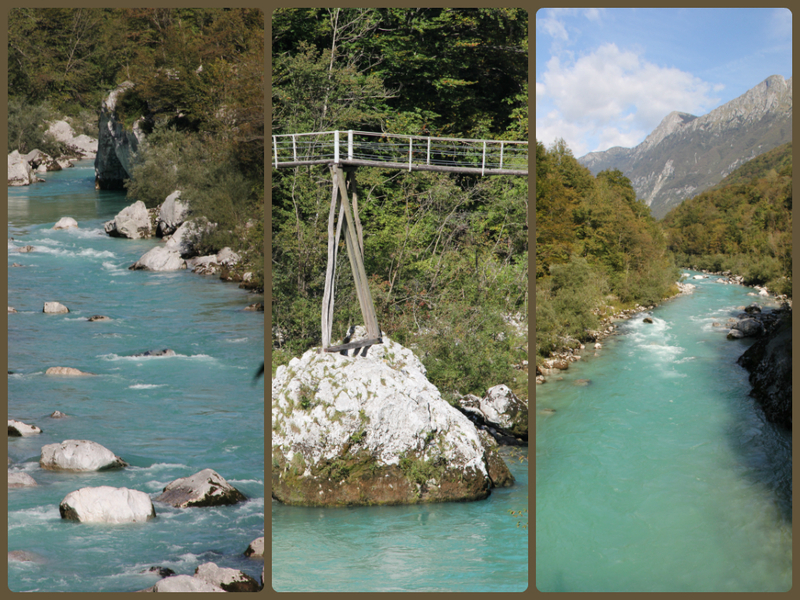 The Reka river (‘Reka’ means ‘river’ in Slovenia, hence the River river!) enters the caves in a gorge below the village of Skocjan, and as you cross the Cerkevnik Bridge you can see it flowing through some 45 metres below you. Whilst I’d love to share some photographs with you, of mighty stalagmites, curled wind-blown stalactites, narrow spot-lit walkways hugging the cave walls, bats circling the cave roof high above my head, and the humbling size of this enormous underground network, photography was unfortunately not permitted anywhere inside the caves. Ordinarily I would not understand the need for such a rule, but here – where the walkways are tight, slippery, metres above ground, and precarious in places – the distraction of taking a photograph may tip you over the edge. Literally. We’d had to wait until 10am for a 2-hour ‘guided tour’ around the Skocjan caves, so if we were to make it to Zagreb (avoiding the toll roads) before nightfall, visiting the Postojna caves as well was not an option. So we set off along the back roads, past lake Cerknica and towards the Krka river valley, through a region where several road signs alerted us to the fact that we were entering bear territory. As many as 500 brown bears are believed to live amid Kocevski Rog’s 200 hectares, and as we drove along roads flanked by tall pine trees in dense forests, a bear sighting certainly wouldn’t have seemed out of place. On this occasion, a bear sighting escaped us (fortunately or unfortunately, I’m not entirely sure! 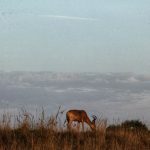 ), but we did spot a wild deer, standing alone in a nearby field. By the time we drove through Ribnica, we were desperately in need of a coffee and a bite to eat. However, aside from major tourist attractions, there appeared to be a definite absence of life in Slovenia on a Sunday afternoon. Finally we stumbled upon a lovely little sunny eatery in Lašče, popular with the bikers due to the road of sweeping bends upon which it sat. Here we translated the whole menu using Google Translate and then discovered they actually had an English one available upon request! Despite crossing the border relatively easily and in daylight, a combination of not having a detailed road Atlas (or really much of a road Atlas at all!) for Croatia, and trying desperately to stay on the A roads (thus avoiding the motorway tolls) we subsequently got very lost in Samobor. Consequently, we arrived into Zagreb in total darkness, and proceeded to drive around its one-way system in increasingly frustrating circles for what seemed like hours. Having utilised the extremely intermittent non-secure wi-fi connection I’d found at Lašče earlier to browse the Hostelbookers website, we eventually landed a totally awesome hostel right on the edge of Zagreb’s old town, complete with on-site parking and its own bar. If you don’t arrive here a poet, you’ll certainly leave with poetic musings about the place running descriptively through your thoughts. The simple beauty of the place is very difficult to put into words, yet you’ll leave desperately wanting to do so. There are various different trails around the lakes, depending on the length of time you want to walk for. Although there is the odd climb up to a waterfall or into a cave, a high level of fitness is certainly not required – just plenty of fluids and enough space on your camera’s memory card. 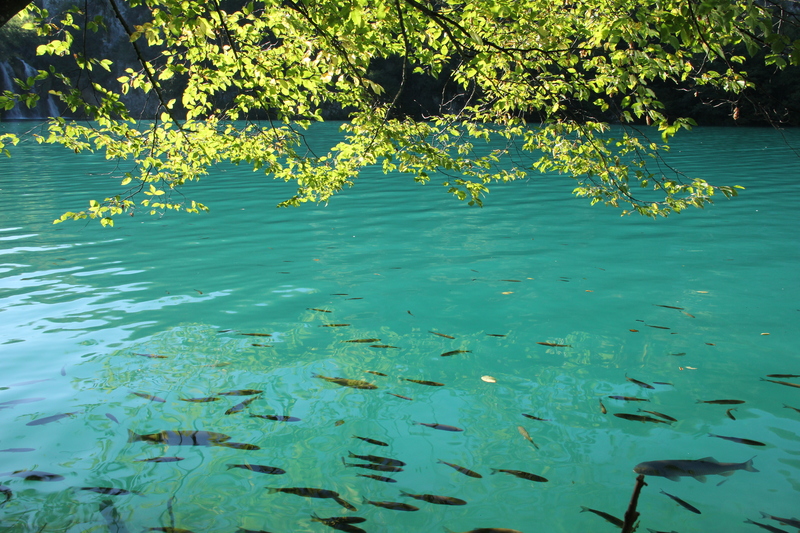 The park is landscaped beautifully, with thoughtfully created wooden walkways crossing crystal clear blue-green waters full of fish. 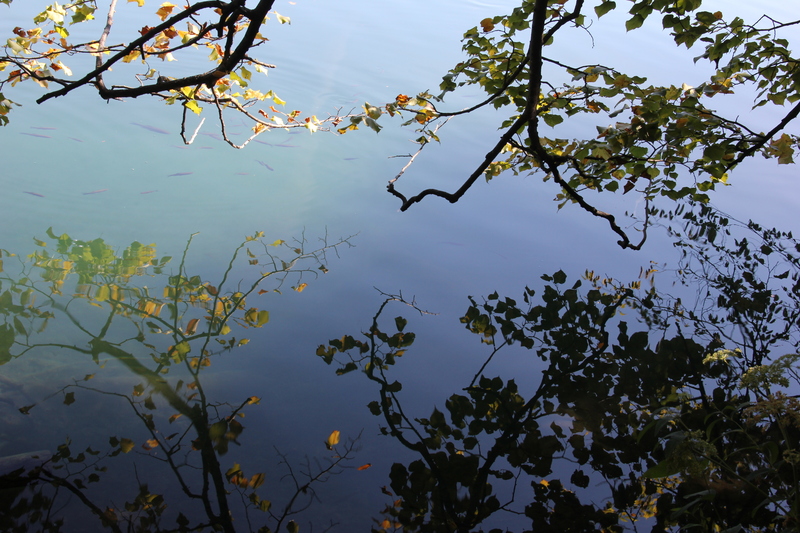 Autumnal colours adorn the trees, many of which overhang the lake and reflect beautifully upon its surface. 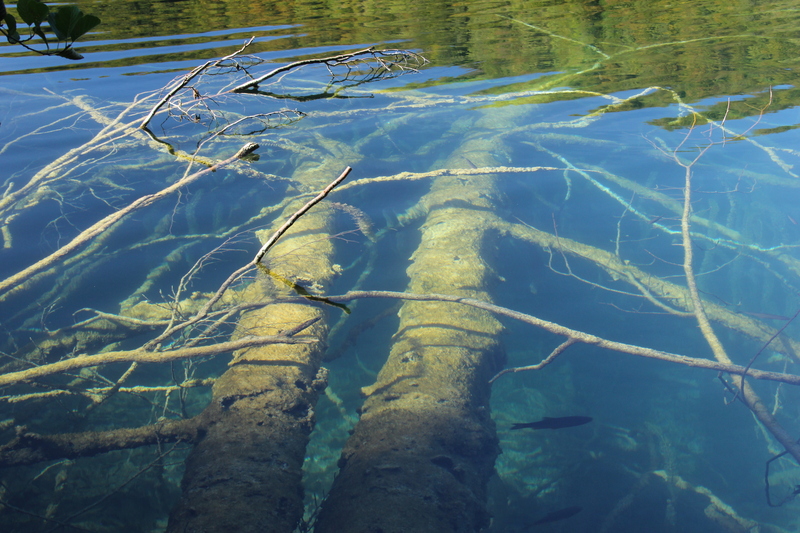 Petrified trees lie abandoned in the waters, maintaining a strange sense of chilling beauty. As we wandered we were continually met with the sounds of running water. 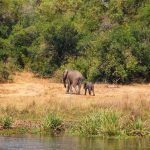 Whether it be flowing calmly over rocky escarpments or tumbling down from a rocky ledge above us, it was lovely to hear the anticipation of what nature had waiting for us around the corner. 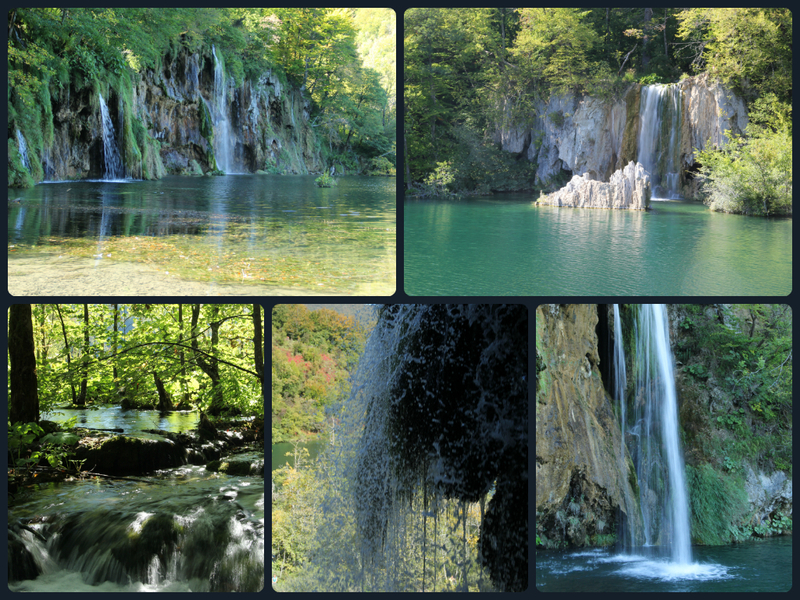 We spent around 6 hours at the Plitvice lakes. At 16 euros for a ticket it’s not really worth spending any less than that…besides, why would you want to? This place is like a little piece of heaven away from the hustle and bustle of everyday life, and I’m so glad I made the effort to finally come here. 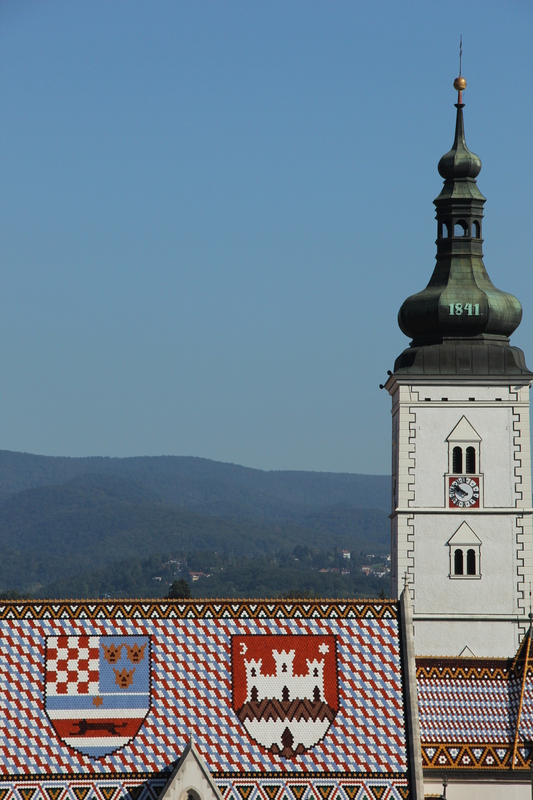 Zagreb – Croatia’s capital city. Sadly the only reason I was here on this occasion was as a stopover before and after our trip to the Plitvice lakes. Walking around the city on the final morning of our trip, I realised just how much of a shame that was. Zagreb has a lower and upper town. The upper town (Gornji Grad), reached by a short funicular ride or a series of steps, is the old part of the city, with it’s colourful architecture, cobbled streets, and vibrant cafe culture. 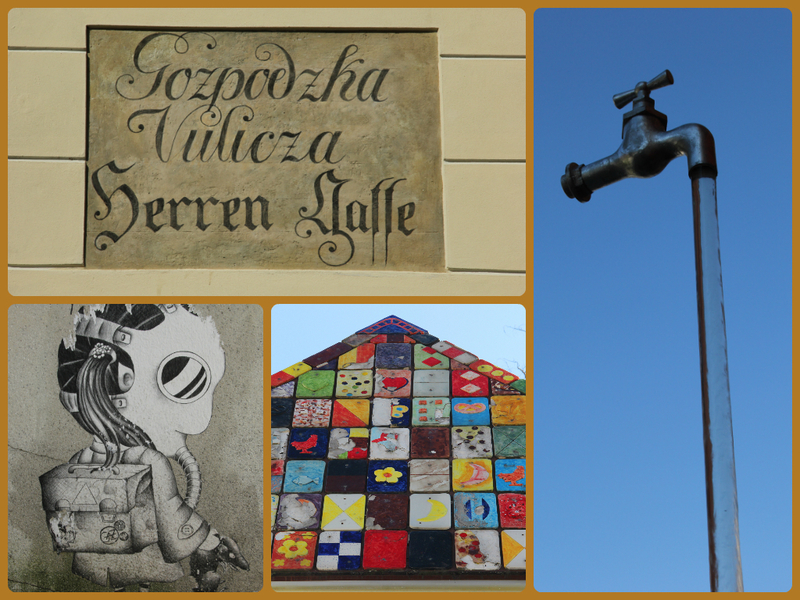 Wandering around Zagreb’s old town on a gorgeously sunny morning, surrounded by bright mosaics, quirky street art, surreal water features and beautifully crafted street signs, I decided that this is definitely a city I’d like to come back to. Just hours later as we were driving up the motorway back to Ljubljana – with the window wound down, the sun blazing in, and the scenery rushing past me – I reflected upon our Slovenian road trip. I’d seen so much more of this country than I’d ever dreamed possible in 9 days. From lakes to mountains, castles and caves, we’d driven along open roads and through hair-pin bends, witnessed awe-inspiring views and stunning, colourful architecture, we basked in the sunshine, dodged the rain and got woken by thunder, we experienced touching hospitality, we cooked, we ate, we tasted local wine…. 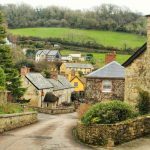 Yes, I’ve written fondly about the vast array of cities, towns and villages that we found ourselves laying our hats for a few days or simply passing through, and I’d definitely recommend visiting every single one of them. But the beauty of having a car is that you don’t have to. You have the freedom to build your own adventure. Just like I did. We hired our car with Hertz. We were able to pick it up from a downtown location in Ljubljana and drop it off at the airport at no additional cost. There was also no additional cost for crossing the border into Slovenia. The insurance options were a lot clearer than some of the other popular hire car companies with whom we enquired. However do watch out for the additional charge for using the toll roads (which you have to pay even if you don’t use them and which was not explained to us – hence why we avoided using them as much as we did) The car we were given fitted our requirements perfectly and was super fuel efficient (we only filled up twice during our trip). Our only minor complaint was that it was a little twitchy at higher speeds – but then we are used to a Land Rover back home! 3 countries. 2 wheels. No previous cycling experience. This is such a brilliant post…Thoroughly enjoyed reading it and the photographs are spectacular. I was particularly blown away by the architecture of Predjama Grad..Truly spectacular!!!! Aw, thanks so much for your kind words Pankaj 🙂 I’m still fairly new to this blogging business so it’s always really rewarding to know that people are enjoying what I write and photograph! Wow! This is an amazing post full of inspiration. Definitely I’ll return here to follow the same path. I never been in Slovakia and I’m really close. I’ve driven around Slovenia numerous times and I love it more with each trip. 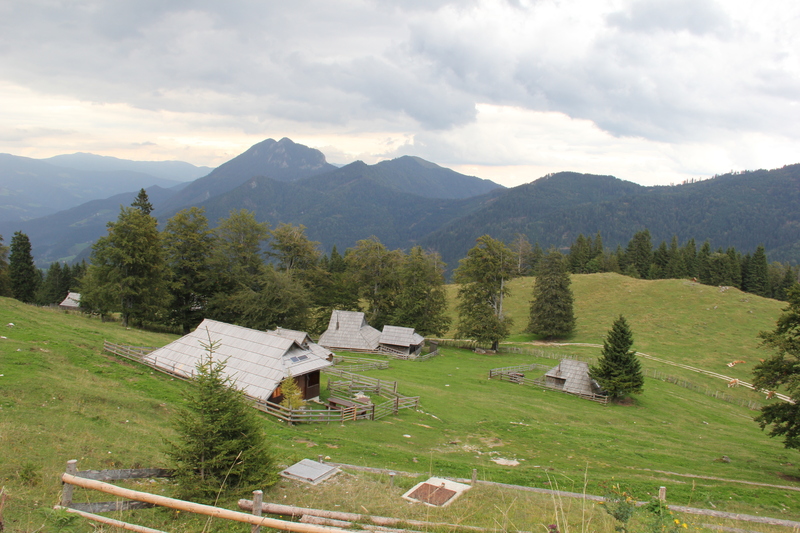 The countryside is spectacular although I experienced the same initial disappoint at Bled as you did. Visiting as sunrise is the best way to avoid the crowds. 🙂 Reading about your trip brought back many memories. Wow! 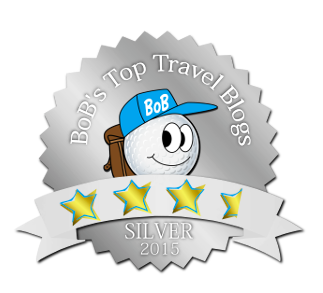 I’ve read numerous articles and blogs about Slovenia but this is amazing!! I was there myself in May this year, but no car so public transport dependent. 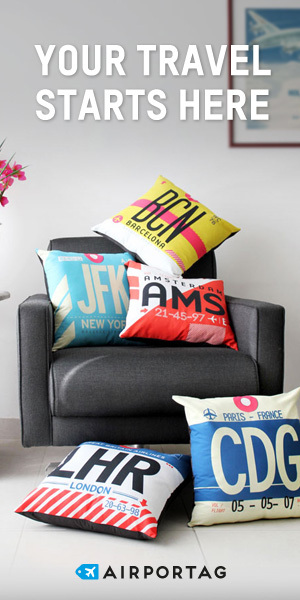 Based in fantastic Ljubljana and trips out from there. I was impressed with Kamnik (and the nearby Volčji Potok Arboretum), blown away with Skofja Loka, Bled, Vintgar Gorge, Predjama castle and Postojna caves – where photos are allowed 😉 , but no flash, for obvious reasons. Loved the Open Market food and wine extravaganza in Ljubljana on Fridays, the riverside walks, Botanical Gardens, and a nightcap of superb Slovenian sauvignon watching the sun set from Nebotičnik. Stunning meal in Pri Skofu and Druga Violina was pretty close behind it.